Here, seven New Orleans-inspired dishes to make for Fat Tuesday. The muffuletta is the quintessential New Orleans sandwich of cured meats, cheese and tangy olive salad piled onto a sturdy Italian loaf. Étouffée—from the French word for smother, stew or braise—is a classic Cajun dish of shellfish (or sometimes chicken) served over rice. Caramelized bananas Foster originated at the legendary Brennan’s in New Orleans. To transform it into a brunch dish, bake the bananas on tender crêpes. This renowned baked oyster dish was created at Antoine’s Restaurant in New Orleans in 1899 by the proprietor, Jules Alciatore. According to legend, the dish was created as a substitute for baked snails, which were hard to obtain from France. It was named in honor of John D. Rockefeller, at that time one of the world’s richest men, because of the sauce’s intense richness. Star chef David Kinch playfully combines two New Orleans classics: chicory coffee and beignets. 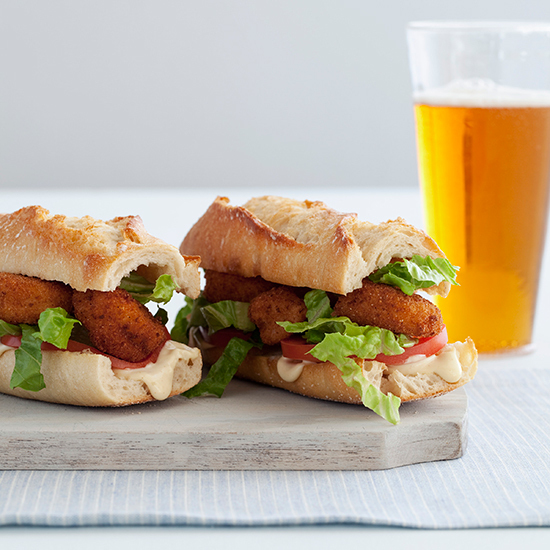 Crispy fried shrimp are stuffed into a hollowed-out baguette that's been buttered, toasted and spread with a zesty sauce. Use more Tabasco in the sauce to suit your taste. This unusual bread-pudding soufflé, flavored with raisins and topped with a silky bourbon sauce, is as custardy as bread pudding and as light and fluffy as a soufflé.